On July 21, the Tokyo Electric Power Co. (TEPCO) announced that it had investigated the interior of the primary containment vessel (PCV) of Unit 3 at the Fukushima Daiichi Nuclear Power Plant (BWR, 784MWe) using a submersible robot made by Toshiba Corporation. It added that the robot had captured images of something that had melted and solidified below the pressure vessel. The following day, July 22, operating the robot again, TEPCO said that it had identified rocky objects scattered around at the bottom of the PCV, which had likely melted and fallen from above. The company believes that those objects could contain fuel debris from the core meltdown. In all, the submersible robot was successfully operated on July 19, 21 and 22, reaching the deepest area of the PCV, and obtaining valuable images of the bottom area. With that part of its investigation of Unit 3 complete, TEPCO recovered the robot. Henceforth, the power company will analyze the images obtained so as to estimate the volume and distribution of the lumps. That information will be used when it how to remove the fuel debris. 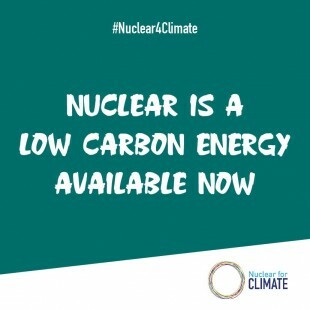 From previous analyses at Unit 3, it was expected that most of the nuclear fuel had melted and fallen to the bottom of the PCV from the pressure vessel. The three days of investigations have supported that theory. Additionally, it was found that fuel debris lies spread over a wide area immediately below the pressure vessel. 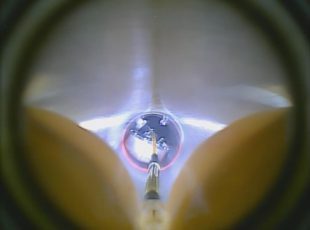 In the images obtained by the submersible robot, melted material appears to be hanging under the pressure vessel from metal devices that formerly were used for inserting and withdrawing the control rods. Orange and black melted material appears to be piled up in the area of the foundation supporting the pressure vessel. 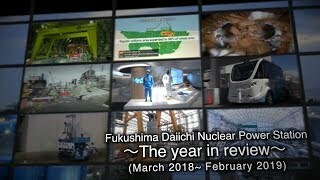 Separate investigations of the PCV interiors at other Fukushima Daiichi units had been conducted in February (Unit 2) and March (Unit 1), using different types of self-propelled devices. At Unit 2, detached or deformed gratings (latticed drain boards) were found inside the pedestal, along with substantial deposits. At Unit 3—whose interior PCV water level is higher than those at Units 1 and 2—the series of investigations utilized a submersible robot inserted through the penetration. That robot had cameras installed at both its front and rear. According to the official “Mid-and-Long-Term Roadmap” toward decommissioning, the method for removing fuel debris from each of the units is to be determined later this summer (METI Minister said “September” in this morning).